My baby will be a year and a half next month! I am in disbelief. The past seventeen months have gone by way too fast. The past few days I have been looking through all of his old picture/videos, and I can't believe how much he has grown. It has been and continues to be a beautiful adventure. GROWTH: He has his 18 month check up next month. I'll have all accurate stats next month. However, I have noticed he's gotten a little heavier and he looks so much taller. Evan still fits in most of his 12 month clothes, but I have been purchasing 18-24 months just in case of a sudden growth spurt. We have retired his size four shoes(including his moccasins) and I just want to shed a couple tears. He is now a size five maybe even a six depending on how the shoe runs. CURRENT WORDS & OTHER MILESTONES: I should post more videos of Evan talking. He repeats EVERYTHING! I have a copy cat on my hands. I have noticed that the more we sing the more words he learns. His favorite word is NO. If it's not the song or toy he wants I get a "no, no, no mama." I could write a list of all the words he's saying, but I'm going to keep it short and sweet. 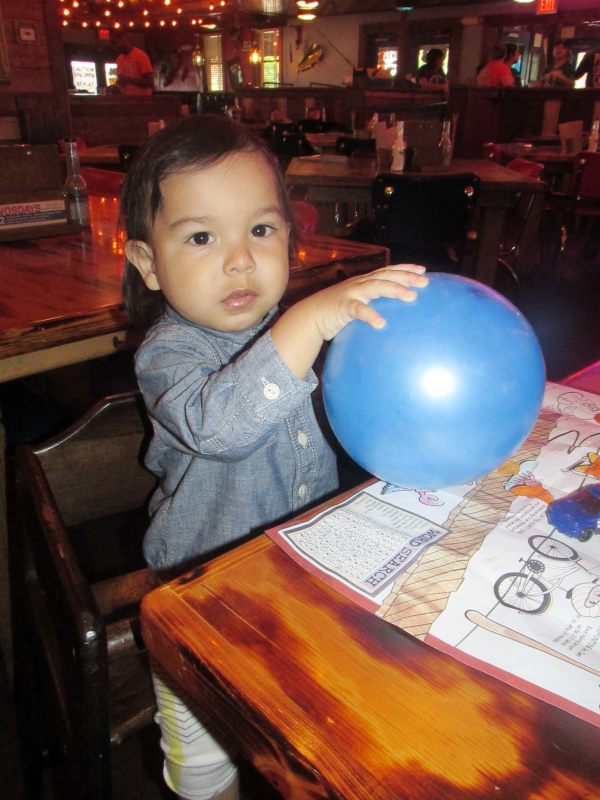 Lets just say this boy can talk! Evan can count to two and repeat a couple letters. He know where his nose and mouth are, he also recognizes two colors(red&blue). TEETH & SLEEP: He has twelve teeth. His naps have been shorter during the day, but he's not constantly waking up at night. I'm still nursing and he's still waking up occasionally for a feeding, but no where near as many times as before. We both have gotten more sleep, which means we both have been in better moods. It's a win win if you ask me. FAVORITE FOODS: I am so thankful that Evan will eat whatever I serve him. He's not a picky eater and I love that about him. He is however a messy eater, and he will only eat if he's feeding himself. I am all for it as long as he eats. I don't mind cleaning his mess if he eats all his veggies. FAVORITE TOYS/ACTIVITIES: Oh how he loves the outdoors. The weather has been amazing and we spend most of our days outside. Sticks and dirt have become his best friends. When we are not outside he loves throwing and catching his ball, pushing his shopping cart, playing with his cars, or legos. Singing, dancing, and climbing on everything. He loves taking baths and washing his hands. I can't leave out talking on the phone. LEAST FAVORITE ACTIVITY: After being outside for a long period of time, bringing him back inside is a nightmare. There are days I just want to stay inside to prevent getting him upset. Brushing his teeth and changing him after his bath are no fun either. The only thing that seems to cheer him up is breast-milk. Nothing else seem to work. 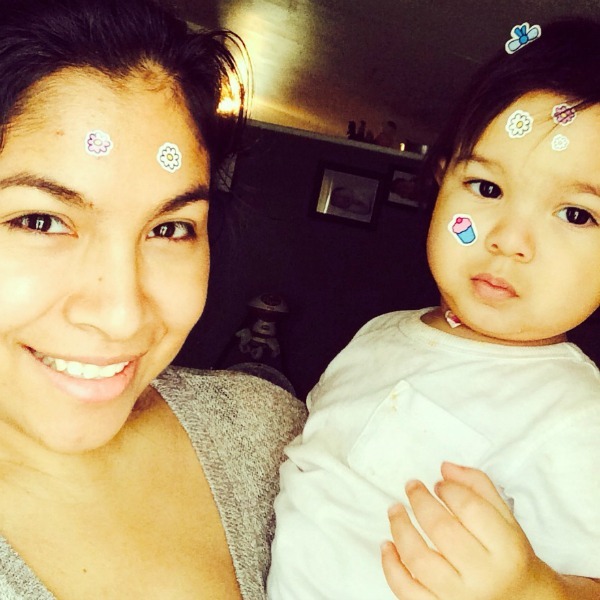 What do you do when your little one gets upset? EXTRA COMMENTS: How did I ever live without you? You are amazing. Your personality has developed in a way that I had never anticipated. You are so kind and caring. You learn so much and so quickly in a short period of time. You never seize to amaze me. Our adventure has been the most incredible experience of my life. I can't wait to see who you become one day. I love you. Welcome To The TGIF Hop! linking your blog and/ or your instagram below. You may link up any post. Remember, visiting other blogs and/ or Instagram links is what makes a successful blog hop. This hop runs from every week. Starting Friday morning to Wednesday morning. 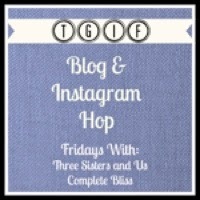 Be kind and grab a TGIF BLOG HOP button below. 2. Please Follow the hosts and cohosts on Instagram if you link up your account below. 3. Please leave a comment stating that you are following and where so we can follow you back and get to know you! Sometimes it can be hard to know which is a new follower and we don't want you to think we're rude. 4. Tweet the hop below to help us grow. It's greatly appreciated. 5. Be social. Meet new friends. *You do not need an Instagram account to link up. Every first Friday of the month we will be hosting a lovely GIVEAWAY! Would you like to be the next weekly TGIF co-host and receive a spotlight? This hop is free. Hey there! 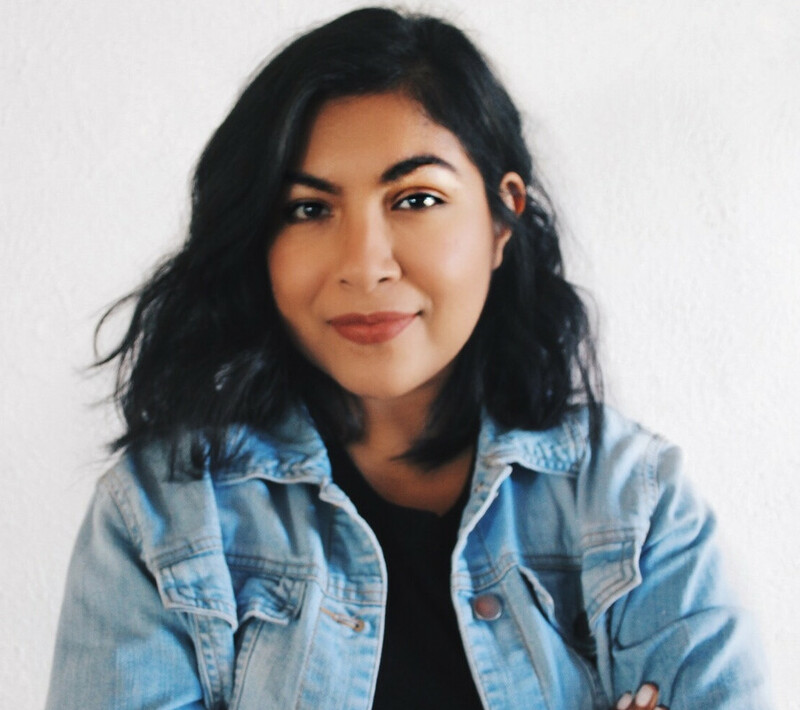 I'm Vanessa from Nessa's World, where I blog about fashion, life, my adventures as a first time mom, and whatever else I decide I want to talk about that day. 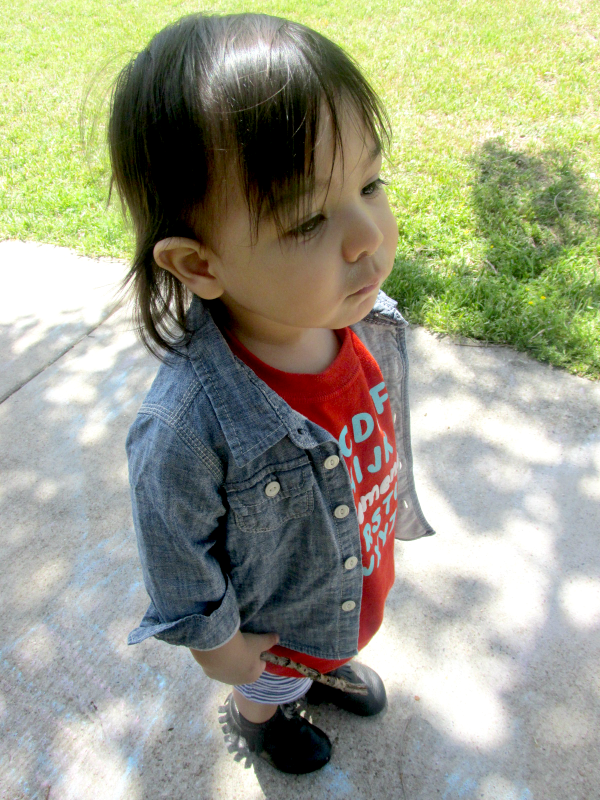 I am a twenty three year old living in Texas with my beautiful 17-month old, Evan and boyfriend. 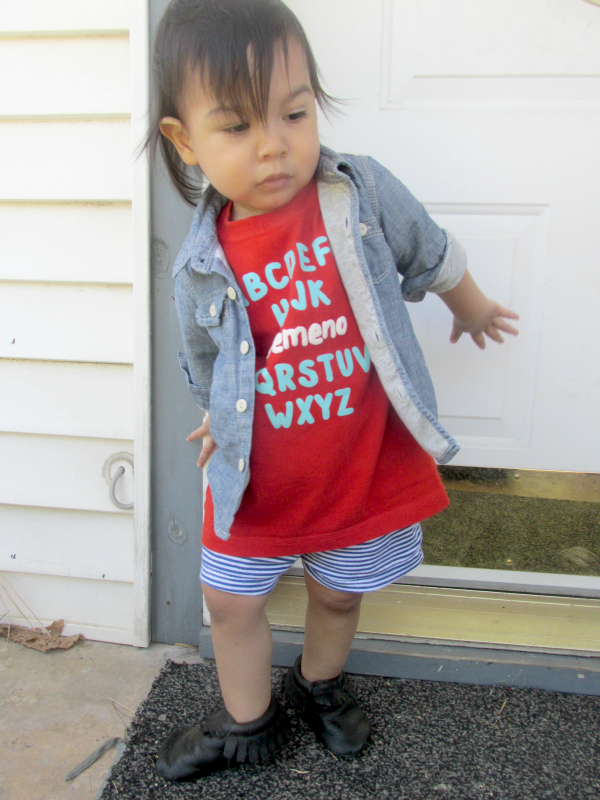 I am a stay at home mom, who has found an obsession with blogging about my life. You can read more about me here. Want to be a future cohost? Click here!! Tweet about this HOP by clicking "tweet" below!! Easter was such an amazing experience. Last year we didn't fully celebrate, so I knew this year would be twice the fun. 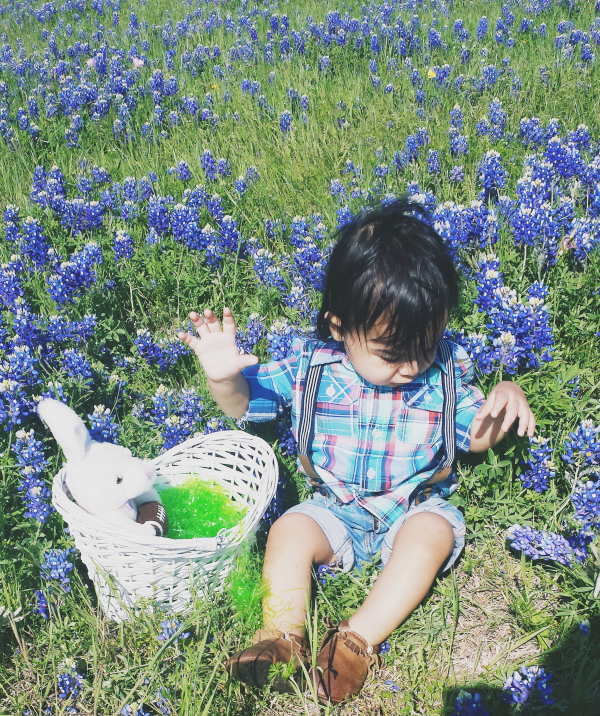 On Saturday we thought it would be a great idea to take Evan to a bluebonnet field and take pictures. He absolutely loved it and was actually careful not to step on them as we explored and did a mini photo-shoot. If I haven't said this before I am one of the worlds worst procrastinators, but this year I purchased everything for Evan's basket on time. I was so relieved and proud of myself after walking the empty Easter aisle. I put it together on Saturday. I could see the excitement in Evan's face as he saw me put it together and I couldn't wait for him to experience such a beautiful holiday. Evan is so loved his aunts and uncle put together a separate basket just for him and his cousins full of goodies and treats. On Sunday we woke up extra early, as always and we did a couple activities with the kids, including egg dyeing. It ended in a huge mess, but worth a good laugh. I regret not taking good quality pictures on Sunday. Evan kept me on my toes(as always) while he ran around chasing all the other kids. I don't think he had spent so much time outside and his energy was on another level. 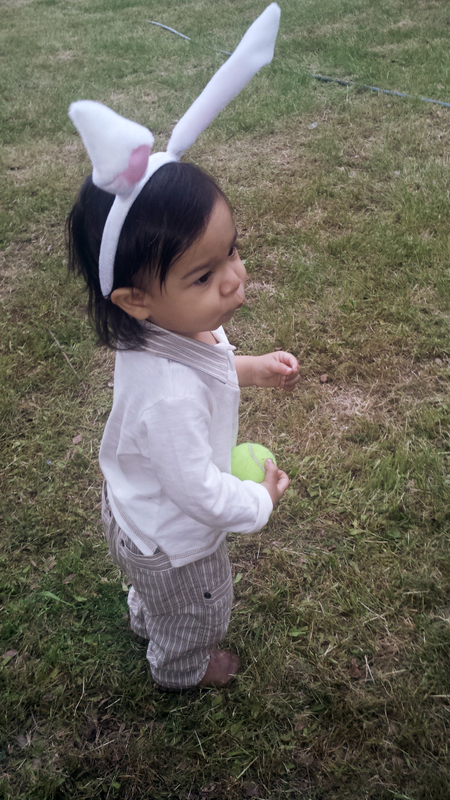 Once the Easter egg hunt started he would grab an egg, open it to discover what was inside, and he would put it back down. This caused all the other kids(older kids) to steal his eggs. I think it bugged me way more than it did him. He didn't mind and continued running around happy as can be. Overall it was a day spent with our crazy family and lots of delicious food. I am all about making memories with my family and this Easter was by far the best. I can't wait for many more. I hope your holiday was just as magical as ours! I haven't been on here as much as usual. 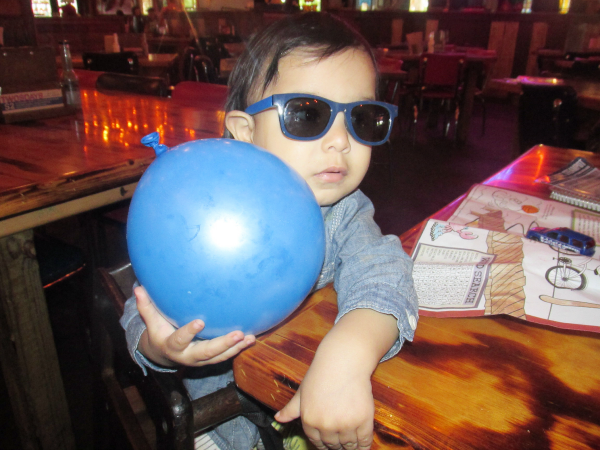 I normally blog after the boys are asleep, but lately I have been falling asleep early. I gave myself a little break since I know I'm going to be crazy busy in May. I had to purchase myself a cute planner because honestly, my little blog is kicking off and I am extremely thankful. Over a week ago I received a very exciting email. Evan and I were given the opportunity to represent an amazing brand. 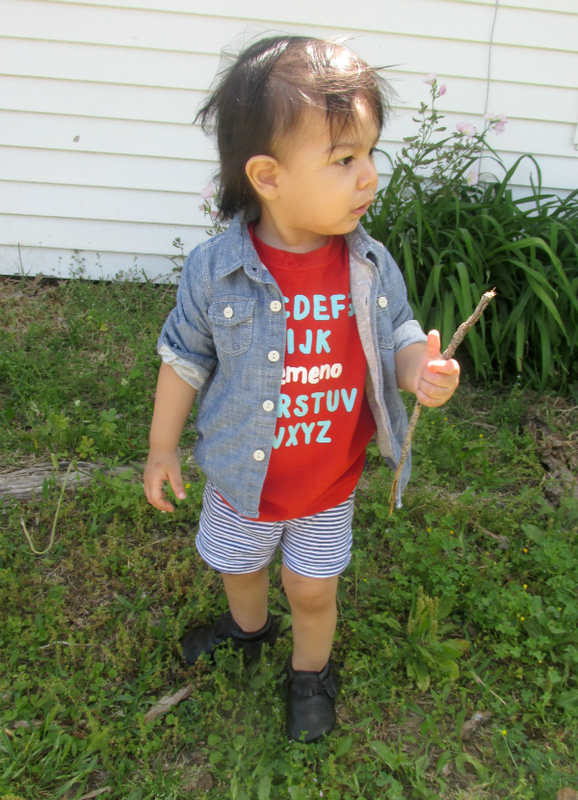 If you haven't heard, Evan and I are brand enthusiasts for Sugarplum Lane Baby Boutique. We are over the moon excited about this amazing opportunity. 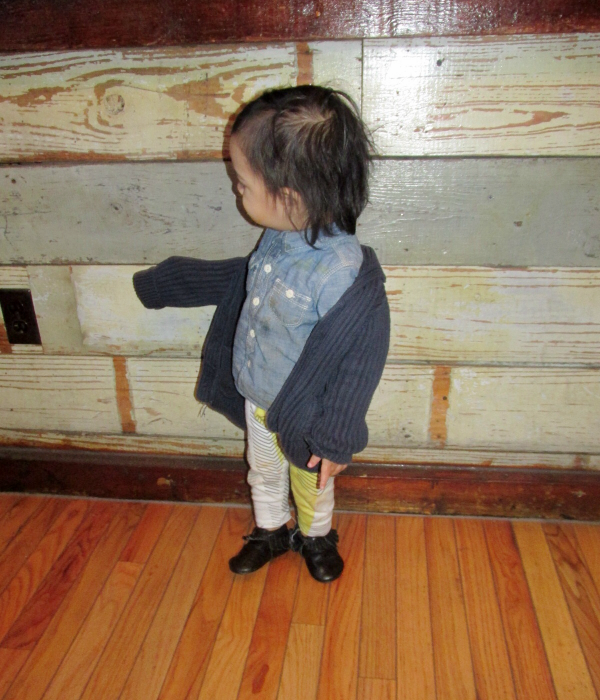 My love for baby fashion began with a pair of star leggings from Sugarplum Lane. 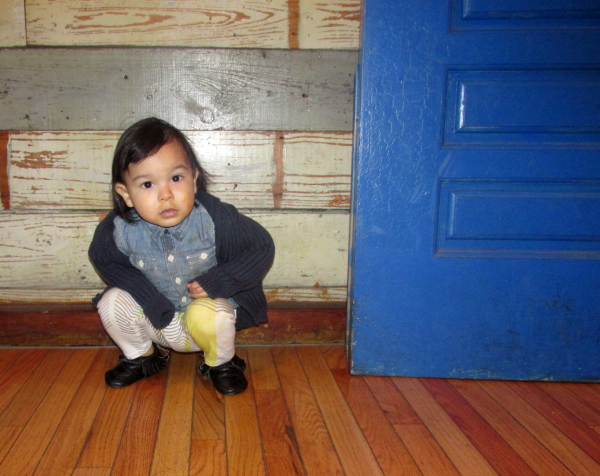 Be prepared to see a lot more of us on here and Instagram(@nessaswrld & @sugarplumlanebaby). Thank you so much for your continuous love and support. My little blog means so much, and seeing it take a step forward means the world. I am currently seeking bloggers or shops/businesses to collaborate with in May. Please contact me for more information and blog stats at nessaswrld@hotmail.com . Thanks for stopping by! I am so excited to make Evan's basket this year. It feels like our first Easter since we didn't fully celebrate last year. I hope I don't go too crazy with it. 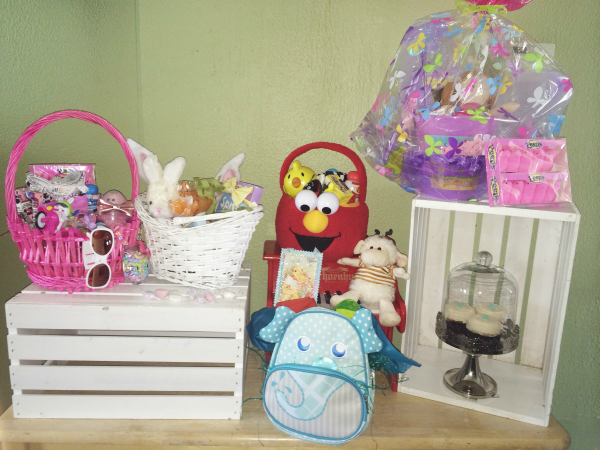 Here are a few goodies that will make your little one's basket extra sweet. 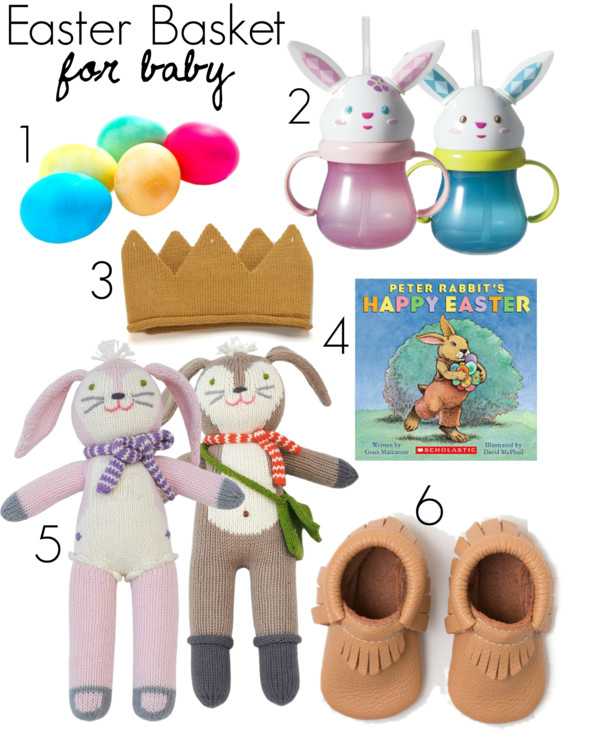 I know for sure most of these items will be in Evan's Basket. 1.Eggs - I am so excited to decorate eggs this Easter. I have found so many DIY projects on Pinterest. I am literally counting down the days until Easter. 2.Bunny Sippy Cup - Evan loves to drink from his sippy cups. I know this is something he will enjoy, but more importantly use. I can't get over how cute these are. Target never disappoints. 3.Crown - I am convinced that every little kid needs this crown. I've been on a hunt for this crown and it sells out so fast. Crossing my fingers that it restocks soon. 4.Easter Book - You can never go wrong with a cute holiday story. I will definitely be adding a book to Evan's basket. We love to read and a new book always makes Evan happy. 5.Blabla Doll - These are the cutest dolls ever! 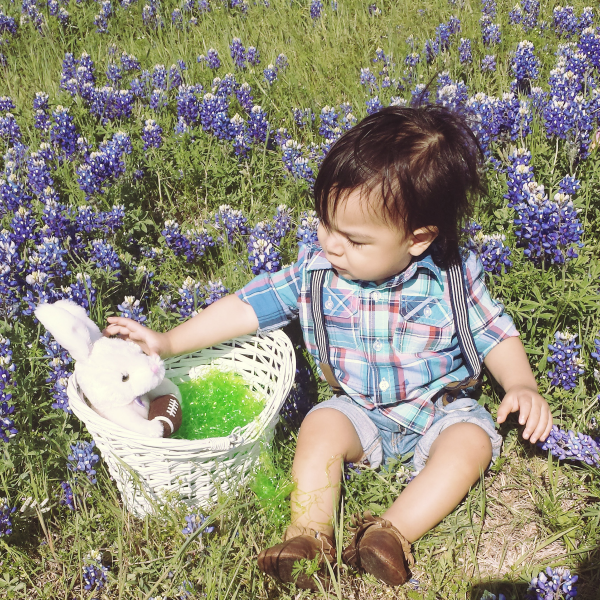 Babies need this bunny in their basket. I love that they have a different color for boys and girls. 6.Freshly Picked Moccasins - Moccasins will always make the cut. Ha! They are just too awesome not to be included in your little one's basket. I am seriously drooling over the new butterscotch. If anyone needs advice or help on planning an event or outing check out Gogobot for amazing travel experts. Having a baby completely changes your life. It's so funny thinking back to when I would make comments saying I would never let go of myself after having my baby. That I would make sure I always looked cute and I wouldn't stop wearing heels. HA! Clearly I had no idea what was in store. Isn't is crazy how so many little things change? Here are five signs you're a mom. [ONE] You don't have time to comb your hair. Which leaves you no other option but to rock that mom bun all day everyday. [TWO] Checking out at the grocery store is a nightmare, because finding your wallet is impossible. You give the cashier a very interesting "what's in my purse? ", digging through those endless toys/baby items. [THREE] You catch yourself singing your kid's music in the shower, and know all about their favorite TV/movie characters. [FOUR] You've created a new language. Full of baby talk, animal sounds, and weird noises to please/communicate with your baby. [FIVE] You only have ONE strong arm, because you're constantly holding your babe on one side more than the other. So funny and so true! Regardless of the changes I wouldn't have it any other way! I was a guest blogger over at Love, Joleen. I am sharing my three wardrobe essentials for baby. It will mean so much if you guys check it out!! Thanks! !